High-mobility group box protein 1 (HMGB1) is a non-histone nuclear protein that has a dual function. Inside the cell, HMGB1 binds DNA, regulating transcription and determining chromosomal architecture. Outside the cell, HMGB1 can serve as an alarmin to activate the innate system and mediate a wide range of physiological and pathological responses. To function as an alarmin, HMGB1 translocates from the nucleus of the cell to the extra-cellular milieu, a process that can take place with cell activation as well as cell death. HMGB1 can interact with receptors that include RAGE (receptor for advanced glycation endproducts) as well as Toll-like receptor-2 (TLR-2) and TLR-4 and function in a synergistic fashion with other proinflammatory mediators to induce responses. As shown in studies on patients as well as animal models, HMGB1 can play an important role in the pathogenesis of rheumatic disease, including rheumatoid arthritis, systemic lupus erythematosus, and polymyositis among others. New approaches to therapy for these diseases may involve strategies to inhibit HMGB1 release from cells, its interaction with receptors, and downstream signaling. High-mobility group box protein 1 (HMGB1) is a highly conserved nuclear protein that is a prototype for a unique class of proinflammatory mediators called alarmins. As a group, alarmins display distinct intracellular and extracellular activities, with potent stimulation of the innate immune system as their cardinal feature. While the intracellular functions of alarmins vary, in their extracellular form, they function as pro-inflammatory mediators to alert the immune system to tissue damage and to trigger an immediate response. A key facet of the biology of alarmins is therefore their translocation from the inside to the outside of the cell . During the past decade, studies in both patients and animal models have established the alarmin activity of HMGB1 in acute and chronic inflammatory conditions, including the rheumatic diseases. Since HMGB1 may be a target of new therapy, HMGB1 biology has emerged as a rapidly expanding field of both basic and clinical research. This review will summarize the role of HMGB1 in the pathogenesis of the rheumatic diseases and its potential as a therapeutic target. Mammalian organisms have evolved diverse systems to recognize certain molecules as 'danger signals' and respond quickly to life-threatening events, including infection and trauma. These danger signals can arise from exogenous as well as endogenous sources and can induce innate and adaptive immune responses. Exogenous danger signals from microorganisms are also called PAMPs (pathogen-associated molecular patterns) whereas endogenous danger molecules are also called DAMPs (damage-associated molecular patterns), reflecting their respective origins . Among endogenous danger molecules, alarmins differ in biochemical structure and interact with a variety of receptor systems, including the Toll-like receptors (TLRs). Irrespective of their structure or intracellular location, alarmins share the following features: (a) rapid release from cells in response to infection or tissue damage, (b) chemoattraction and activation of antigen-presenting cells, and (c) activation of innate and adaptive immunity. HMGB1 is probably the best-characterized alarmin. Other examples are the defensins and eosinophil-derived neurotoxin. HMGB1 was first discovered as a nuclear protein with rapid migration in electrophoretic gels, a property leading to its name. HMGB1 is a member of the high-mobility group (HMG) protein superfamily, whose members are abundant and ubiquitous nuclear proteins. HMGB1 is found in all mammalian tissues and is highly conserved among various species. As shown in biochemical studies, HMGB1 is a single polypeptide chain of 215 amino acids in length and is organized into two DNA-binding regions (termed the A box and B box) and an acidic tail [3, 4]. While primarily nuclear, HMGB1 can be present in the cytoplasm as well as the surface of certain cells. Thus, Rauvala and colleagues  identified a surface protein that promotes neurite outgrowth. Originally called p30, this protein was renamed amphoterin because of its content of both acidic and basic residue segments. The sequence for amphoterin matches the sequence of HMGB1, establishing HMGB1 as a membrane protein on certain cells [5, 6]. HMGB1 binds DNA as well as nucleosomes and plays an important structural role, modifying chromosomal architecture and regulating transcription. HMGB1 has a preference for certain DNA conformations and sequences, with a particular predilection for DNA with distorted structures such as bends. HMGB1 readily circulates in the nucleus and may contribute to transcriptional regulation by altering chromatin structure as well as interacting with transcription factors to promote their binding with DNA . While the precise nuclear function of HMGB1 is being elucidated, the absence of this protein is postnatally lethal, with newborn knockout mice succumbing to hypoglycemia. Although HMGB1 has immunostimulatory activities, its assay differs from that of conventional cytokines which can be measured by either enzyme-linked immunosorbent assays (ELISAs) or functional assays. Indeed, most studies on the expression of HMGB1 have used Western blot assays. Furthermore, because an important determinant of the activity of HMGB1 is its location, microscopy is valuable for defining not only the presence of HMGB1 in a specimen but its disposition inside the cell (nuclear or cytoplasm) and outside the cell. ELISAs for the measurement of HMGB1 have also been described but their use has been limited by interference from other material in biological specimens. In contrast, a cell-based ELISA (enzyme-linked immunosorbent spot, or ELISPOT) to detect individual cells secreting HMGB1 can reliably measure such cells in cultures and provides a useful alternative to Western blotting [8, 9]. The discovery of HMGB1 as an alarmin resulted from efforts to identify mediators of sepsis by characterizing novel proteins produced by macrophages. Using this approach, Wang and colleagues  showed that HMGB1 is released from macrophages stimulated in vitro with lipopolysaccharide (LPS) and, furthermore, that HMGB1 can mediate sepsis in experimental models. Following this seminal report, Scaffidi and colleagues  and Rovere-Querini and colleagues  showed that HMGB1 can be released from necrotic cells and can stimulate necrosis-induced inflammation. Together, these studies established the alarmin activity of HMGB1 and its extracellular translocation in the settings of immune cell activation and cell death. In its role as an alarmin, HMGB1 displays a wide range of immunological effects that resemble those of LPS itself and other cytokines such as tumor necrosis factor (TNF)-α. In addition to its effects on hematopoietic cells, HMGB1 may play an important reparative as well as pathogenetic role in angiogenesis, myogenesis, and skeletal muscle function [13–30]. These activities have been demonstrated in vitro and in vivo, with effects of inhibitors (for example, antibodies) demonstrating their biological relevance in disease settings (these activities are summarized in Table 1). Maturation and capacity to home to lymph nodes. Potential proinflammatory cytokine production in collaboration with PAMP or DAMP molecules. Proliferation and polarization toward TH1. Potentiates activation by DNA-IgG complexes. Increased enterocyte permeability causing barrier dysfunction. Expressed on cell surface by activated platelets. Enhances osteoclast formation and TNF release by direct binding to the TNF promoter. Proinflammatory activity, including chemotactic signals and MMP formation. DAMP, damage-associated molecular pattern; MMP, matrix metalloproteinase; PAMP, pathogen-associated molecular pattern; TNF, tumor necrosis factor; VDJ, variable diversity joining. Dendritic cells (DCs) both secrete and respond to HMGB1. The protein activates DCs and induces a functional maturation, including enhanced expression of CD80, CD83, and CD86 and MHC (major histocompatibility complex) class II antigens. Furthermore, maturing DCs need HMGB1 for proper migration to lymph nodes. HMGB1 enables proliferation and polarization of naive CD4 T lymphocytes toward a T-helper 1 phenotype and acts as an adjuvant in vivo to enhance antigen-induced IgG production [17, 19, 28, 29]. The exploration of functional roles of HMGB1 in adaptive immunity has just started and has been summarized by Bianchi and Manfredi  in a recent review. The mechanism by which HMGB1 acts, while originally appearing to be straightforward, has been increasingly difficult to define. Thus, original studies posited that HMGB1 functions as a cytokine to trigger responses via interaction by receptors used by other danger molecules such as TLR ligands. In these studies, three molecules emerged as candidates for the relevant receptor: TLR-2, TLR-4, and the receptor for advanced glycation endproducts (RAGE) [31–33]. The triggering of three different receptors was surprising, although it could reflect the biochemical properties of HMGB1, including its charged structure and its ability to bind multiple protein sequences . Complicating the interpretation of signaling by HMGB1, there is evidence furthermore that, depending on the source, highly purified HMGB1 may not itself be active [35–37]. Rather than a vagary in preparation or lability in the active moiety, however, these findings could point to a fundamental aspect of HMGB1's stimulatory activity. Thus, for full activity, HMGB1 may need to form a complex with another component to activate inflammation by enhancing effects stimulated by a PAMP, a DAMP, or a proinflammatory cytokine. Importantly, HMGB1 can bind avidly to immunostimulatory molecules such as LPS, DNA, or interleukin (IL)-1β and promote their activity in a synergistic fashion [38, 39]. This feature can affect the range of activities and potencies of HMGB1 preparations (recombinant or purified from natural sources) since the content of other components may vary. In this construct on the function of HMGB1, the important issue is not the contribution of any possible 'contamination' of purified HMGB1 in in vitro experiments but rather the actual function of the protein in vivo. We therefore would suggest that HMGB1 functions in vivo to enhance inflammation by binding PAMPs, DAMPs, and cytokines to promote dual-receptor interactions that may be especially effective because of their proximity. These receptors include RAGE, TLRs, β2-integrin Mac-1, and possibly others. HMGB1-dependent activation and recruitment of neutrophils have recently been described to require a functional interplay between Mac-1 and RAGE . Thus, HMGB1 may act synergistically with other immunostimulatory molecules to modulate their interaction with cells and amplify their activity because of their physical association (Figure 1). The effects of high-mobility group box protein 1 (HMGB1) are dependent on complex formation with different ligands. The figure depicts a possible, highly simplified scenario for the mechanisms for the various functions of HMGB1. During initiation of inflammation from infection, the abundant presence of Toll-like receptor (TLR) ligands will induce signaling through TLR, resulting in strong, proinflammatory cytokine production. The limited presence of HMGB1 at this stage will lead to weak signaling through receptor for advanced glycation endproducts (RAGE), thereby inducing only limited cell migration, proliferation, and differentiation. During the expansion phase of inflammation, an increased concentration of HMGB1, released from both activated and dead cells, occurs at the same time that TLR ligands are still present. Immune complexes formed between HMGB1 and TLR ligands can induce signaling through RAGE and TLR receptors in close proximity to each other. This signaling can increase and possibly prolong cytokine production as well as enhance cell migration, proliferation, and differentiation. During the regeneration/repair phase of inflammation, TLR ligands decrease in amount while HMGB1 is still abundant. This situation will cause signaling primarily through RAGE alone, leading to cell migration, proliferation, and differentiation while cytokine production diminishes. The illustration above shows complex formation between HMGB1 and TLR ligands. It is also possible that endogenous, non-TLR signaling, danger molecules can form complexes with HMGB1 and affect HMGB1 function in a similar way. HMGB1 can also enhance cytokine production when complexed to either lipopolysaccharide or interleukin-1β. The scenario described for the regeneration and repair phase of inflammation would also pertain to the function of HMGB1 during nerve sprouting, muscle cell regeneration, and other non-inflammatory circumstances in which the presence of HMGB1 has been described. In its stimulation of the immune system, HMGB1 may differ from conventional cytokines in another important aspect, kinetics of expression, especially following in vivo induction by LPS, a model used to study septic shock. Whereas cytokines such as TNF-α and interferon (IFN)-γ are produced rapidly following such stimulation, HMGB1 shows much more sustained expression in the blood, with elevated levels persisting long after the levels of the cytokines in the blood have declined . This prolonged expression likely reflects the distinct manner in which HMGB1 is released from cells and from endogenous sources as cells undergo stimulation or stress in the pathological setting. To function as an alarmin, HMGB1 must transit from an intracellular location to the extracellular space. As shown in studies on macrophages and DCs, following cell activation, HMGB1 undergoes post-translational modifications, including phosphorylation, acetylation, and methylation that modify its charge. Once HMGB1 is modified, its interaction with chromatin diminishes. Eventually, HMGB1 translocates to the cytoplasm, where it can enter the endosomal compartment. The exit of HMGB1 from the cell occurs via a non-conventional secretory mechanism as cell activation proceeds [41–44]. In addition to LPS, proinflammatory mediators as well as TLR ligands can trigger the release reaction. Thus, IFN-γ, IFN-α/β, and nitric oxide (NO) can all induce externalization of HMGB1. While TNF-α is often considered an inducer of HMGB1 release, in a study  using an ELISPOT assay, its activity was in fact limited. Among TLR ligands, triggering of only some of these systems can induce translocation. Thus, in contrast to the effects of ligands of TLR-3 and TLR-4, stimulation of murine macrophages by CpG DNA fails to induce translocation although this DNA can potently stimulate cytokine release. While the basis for these differences is not clear, the effect may result from the downstream pathways stimulated. Both TLR-3 and TLR-4 involve the TRIF (TIR-domain-containing adapter-inducing IFN-β) pathway whereas TLR-9 does not [45, 46]. In models on HMGB1 behavior of HMGB1 during cell death, HMGB1 release generally has been considered a feature of necrosis and not apoptosis. This tenet reflects the results of original studies showing HMGB1 release from cells made necrotic by freeze-thawing, heating, or ethanol [11, 12]. Under these conditions, HMGB1 translocation from the cell into the external milieu occurs readily. Since HMGB1 is weakly adherent to chromatin, it can float away from the nucleus as permeability barriers break down or the cell lyses. In contrast, in these experiments, certain cell types such as HeLa cells and fibroblasts induced to undergo apoptosis did not show release; indeed, in these cells, HMGB1 appeared anchored to the nucleus, implying structural modifications to enhance the interactions of HMGB1 and chromatin [11, 12]. Further studies with other cell lines, however, indicated that the dichotomy in the behavior of HMGB1 is not as distinct as originally proposed. Thus, Bell and colleagues  showed that Jurkat cells made apoptotic by chemical inducers or ultraviolet light demonstrated HMGB1 translocation by both confocal microscopy and Western blotting. Although this finding differs from previous observations, it is not unexpected since DNA and nucleosomes are released during late apoptosis (a stage that can be called secondary necrosis) and a host of other nuclear molecules are translocated into blebs. The differences in the behavior of HMGB1 observed may reflect the experimental systems used, including the cell lines and inducers of apoptosis and necrosis. While these issues require further study, understanding the behavior of HMGB1 during apoptosis is relevant to the origin of HMGB1 in disease states where extracellular HMGB1 occurs. Rather than implying inflammation or necrosis, extracellular HMGB1 may point to apoptosis as well. In general, HMGB1 release during primary necrosis exceeds that which occurs during apoptosis, although the extent may vary depending on the manner in which necrosis is induced. The magnitude and functional consequences of HMGB1 release during secondary necrosis of apoptotic bodies are topics that require much further investigation. As an alarmin, HMGB1 potentially plays an important role in a wide variety of immunologically mediated conditions that range from sepsis to autoimmunity. Of these diseases, rheumatoid arthritis (RA) shows the clearest evidence for involvement of HMGB1 in pathogenesis. Indeed, the pathology of the arthritic joint would predict the abundant generation of extracellular HMGB1 since chronic synovitis is characterized by macrophage activation, necrotic cell death (caused by activated complement or ischemia), and apoptosis. In this setting, extra-cellular HMGB1 release could perpetuate synovitis by enhancing the expression of TNF-α, IL-1β, and IL-6 and other proinflammatory factors by macrophages as well as their action. Furthermore, cell membrane-expressed HMGB1 could promote local tissue invasion by activating tissue plasminogen activator and matrix metalloproteinases [48, 49]. Since HMGB1 and TNF-α regulate osteoclastogenesis, HMGB1 may also mediate structural damage by the pannus. Immunohistochemical staining of synovial tissue obtained from mice and rats with collagen-induced arthritis (CIA) or adjuvant-induced arthritis indicates a significant increase in the extracellular expression of HMGB-1 and its appearance in the cytoplasm of macrophage-like cells and vascular endo-thelial cells in particular. In longitudinal studies of synovial tissue from rats with CIA, the production of HMGB1, TNF-α, and IL-β showed similar kinetics for production, without a definite sequential order [49–54]. At early time points, HMGB1 expression in this model is almost exclusively restricted to the nuclear compartment while, as disease proceeds, extranuclear HMGB1 becomes evident in resident cells in the synovium (Figure 2). High-mobility group box protein 1 (HMGB1) expression in collagen-induced arthritis. The presence of cells expressing HMGB1 in the invading pannus of collagen-induced arthritis is shown. In this experiment, the section was stained for HMGB1 using affinity-purified polyclonal rabbit anti-HMGB1 antibodies (BD Pharmingen, San Diego, CA, USA) followed by biotin-labeled Fab2 fragments of a donkey anti-rabbit antibody (Jackson ImmunoResearch Laboratories, Inc., West Grove, PA, USA). The sections then were exposed to avidin-biotin-horseradish peroxidase (Vectastain Elite, ABC kit; Vector Laboratories, Burlingame, CA, USA), and color reaction was generated with diaminobenzidine (DAB). Reproduced with permission from Nature Insight 2002, 420: 845–846 http://www.nature.com/nature/insights/6917.html. Copyright 2002, Macmillan Publishers Ltd. While HMGB1, TNF-α, and IL-1 accumulate in the pannus tissue in CIA, differences that may be relevant to their pathogenetic role are also observed. Thus, in CIA, TNF-α expression occurs in the lining layer as well as in sublining areas in synovia, whereas HMGB1 and IL-1β expression appears to be restricted to the sublining areas. 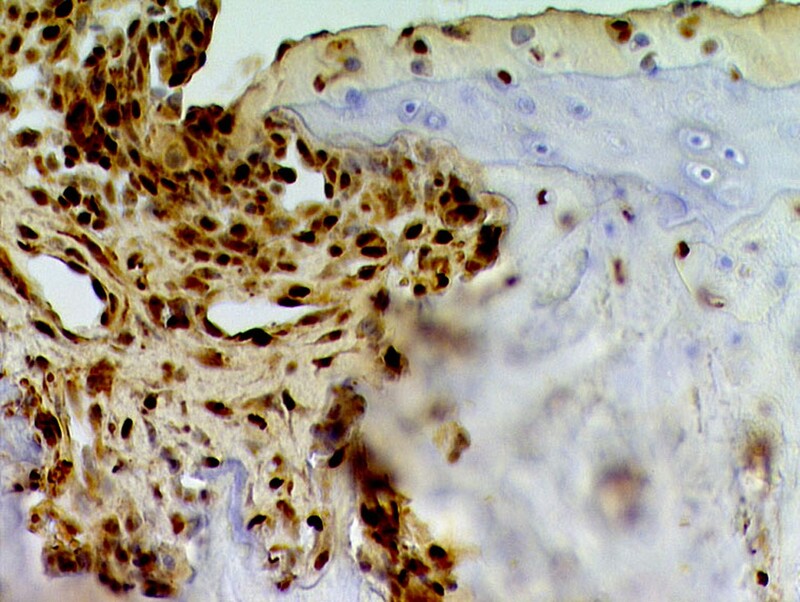 HMGB1 and IL-1β are also present in chondrocytes, which lack TNF-α staining. Of note, intra-articular injection of recombinant HMGB1 into murine knee joints incites an inflammatory response that persists for at least 4 weeks , providing evidence for a direct role of HMGB1 in synovitis. Similar to findings in the animal models, aberrant extra-nuclear HMGB1 expression in RA occurs in serum and synovial tissue and in the synovial fluid [49, 51, 52] from patients with RA. In particular, in synovial tissue, HMGB1 expression is prominent in vascular endothelial cells and macrophages. Levels of HMGB1 in RA synovial fluid are also higher than those from osteoarthritis [49–51]. Synovial fluid macrophages exhibit increased expression of RAGE and can be activated to release TNF-α, IL-1β, and IL-6 by exposure to HMGB1 . Since blockade by soluble RAGE (sRAGE) inhibits the release of TNF-α from cultured synovial fluid mononuclear cells, synovial monocyte/macrophages both can respond to inflammatory agents to translocate HMGB1 and can be activated by HMGB1 to release proinflammatory cytokines. Studies on patients with lupus support a role of HMGB1 in disease manifestations. Thus, biopsies of skin of patients with cutaneous lupus show an increased expression of this protein in both the epidermis as well as dermal infiltrates in affected skin. In these lesions, HMGB1 can be found in both the cytoplasm of cells as well as in the extracellular space, with extracellular localization being an important difference between lesional and non-lesional skin. The origin of the extracellular material cannot be determined from these studies although it could arise from inflammatory cells as well as keratinocytes. While these biopsies did not show necrotic cells, apoptotic cells were present, representing another potential source of the extracellular material. A direct role of HMGB1 in cutaneous lupus is suggested further by findings that increased extracellular and cytoplasmic HMGB1 occurs at the peak of lesions induced by experimental ultraviolet light exposure [56, 57]. HMGB1 may promote the pathogenesis of systemic lupus erythematosus (SLE) by an entirely distinct mechanism. As shown in studies of patients as well as murine models , immune complexes containing DNA and RNA can drive the production of IFN-α by plasmacytoid DCs. This stimulation may involve both TLR as well as non-TLR signaling systems in addition to the Fc receptor. In addition to their content of nucleic acids, the stimulatory complexes contain HMGB1 and can trigger responses via RAGE, which is one of the receptors for HMGB1. Importantly, antibodies to RAGE can block the in vitro induction of IFN-α. The effects of HMGB1 in this setting may involve direct triggering of RAGE, transfer of DNA into cells, and promotion of response by interaction with TLR-9 . A key question regarding the assembly of immune complexes in SLE concerns the source of the constituent nuclear molecules and the role of apoptosis in their expression. As shown in both in vitro and in vivo studies, apoptosis yields abundant amounts of extracellular DNA, the extent of which may increase in SLE because of clearance defects. Since HMGB1 can leave cells during apoptosis, the DNA and HMGB1 in complexes may arise from the same cells during apoptosis. Theoretically, HMGB1 could also bind to DNA in preformed complexes although the kinetics and stochiometry of the process are speculative. It is of interest, therefore, that sera of patients with SLE as well as MRL-lpr/lpr mice have increased amounts of HMGB1; these studies, however, did not determine whether the HMGB1 was free or complexed . Of note, the development of autoantibodies to HMGB1 is a common feature in many autoimmune disorders, although these antibodies may also be found in lower concentrations in a majority of healthy blood donors. The functional relevance of these antibodies is unknown at present . Ulfgren and colleagues  reported in 2004 that HMGB1 is present in an extranuclear location in muscle fibers from patients with polymyositis and with dermatomyositis. In that study, the muscle fibers expressing HMGB1 appeared normal, without signs of degeneration or necrosis. In addition, extranuclear HMGB1 could be detected in mononuclear cells infiltrating the muscle tissue as well as in vascular endothelial cells. Extracellular HMGB1 was also present in these sites; in contrast, extranuclear HMGB1 could not be detected in healthy muscle. Of note, treatment with high-dose predniso-lone decreased the overall level of HMGB1 expression, an effect that appeared to reflect a reduction in the number of infiltrating inflammatory cells. Corticosteroid therapy, however, did not affect the HMGB1 expression in the muscle fibers and in the vascular endothelial cells . The findings on HMGB1 expression in inflammatory muscle disease should be considered in light of reports that HMGB1 levels are increased in regenerating muscle recovering from ischemic injury and that intramuscular injection of recombinant HMGB1 induces both angiogenic and myogenic effects. As shown in in vitro studies, differentiated myoblasts can release HMGB1 that then acts as a chemotactic agent for immature myogenic cells . Others indicate that HMGB1 can suppress sarcomere contractibility by feline cardiac myocytes in vitro, pointing to a functional activity of the released protein . Together, these observations suggest that HMGB1 may play a dual role during myositis. Thus, overexpression of extra-cellular HMGB1 (likely from inflammatory cells) could promote inflammation and muscle fatigue, similar to its effect on cardiac myocytes. Conversely, the extranuclear expression of HMGB1 in stressed myocytes could represent a mechanism to restore muscle function. Through induction of both new vessel formation and migration and differentiation of myogenic cells, locally released HMGB1 could counteract the detrimental effects of the inflammatory mediators released by the infiltrating mononuclear cells. Immunohistochemical studies  have shown that, in tissue from patients with Sjögen syndrome, extracellular and cytoplasmic HMGB1 occurs in mononuclear infiltrates in significantly higher levels than present in salivary glands from both healthy individuals and patients with sicca syndrome. In view of its activities in other settings, HMGB1 and Sjögren syndrome could induce damage as part of a proinflammatory loop with TNF-α and IL-1β, which are also expressed in mononuclear infiltrates. Rheumatology has benefited enormously from the research on sepsis that defined the biology of TNF-α and provided the scientific foundation for the development of TNF blockers as a treatment for arthritis. History may repeat itself with HMGB1 since this proinflammatory molecule, discovered as a mediator of sepsis, may represent a novel therapeutic target for arthritis. The concept of counteracting HMGB1 in inflammatory diseases has so far been explored only in preclinical models with strategies based on HMGB1 neutralization, inhibition of HMGB1 synthesis, and prevention of extracellular HMGB1 release acting successfully in various models of inflammatory and ischemic conditions. Therapies related to autoimmune diseases will be discussed below. Short-term intervention with neutralizing polyclonal anti-HMGB1 antibodies can prevent the progression of established CIA in rodents , reducing clinical signs of arthritis, weight loss, and joint damage. This treatment can also attenuate TNF-α and IL-1β expression and histological signs of inflammation. Despite results with polyclonal antibody, however, monoclonal antibodies (mAbs) against HMGB1 have thus far shown limited or no effects. Indeed, using individual anti-HMGB1 mAbs reacting with different epitopes, we have been unable to improve murine CIA in a reproducible manner (H. Erlandsson-Harris, U. Andersson, unpublished data). To account for the lack of therapeutic activity of mAbs, we can speculate that HMGB1 in vitro avidly may bind different molecules, thereby preventing HMGB1-specific mAbs from recognizing any given epitope of the HMGB1 molecule. In contrast, polyclonal antibodies reacting with multiple epitopes on the whole molecule could circumvent the problem resulting from occupancy of binding sites by ligated determinants. Although mAbs have not worked in arthritis models so far, there is evidence that an mAb can improve the outcome in a preclinical model of stroke. An interesting feature of this antibody relates to its specificity, which is directed to the end part of the repetitive C-terminal tail of the molecule . To our knowledge, this is a unique specificity that has not been explored in other studies. Since the acidic C-terminal part can make extensive intramolecular contacts with the DNA-binding surfaces of both HMG boxes, this feature may make the tail more accessible for antibody recognition; the mAb could also prevent the interaction of other molecules with the DNA-binding boxes. The efficacy of anti-HMGB1 treatment in ischemia is supported by evidence on the benefits of HMGB1 mRNA downregulation in the brain prior to vessel ligation . Structure-function analysis has demonstrated that the DNA-binding B box domain mediates the proinflammatory effects of HMGB1, while the DNA-binding A box is an anti-inflammatory molecule that inhibits these activities mediated by full-length HMGB1 protein . In a study of CIA, systemic administration of A box protein reduced mean arthritis score, disease-induced weight loss, and histologic severity  in mice and rats. Furthermore, immunohistochemistry showed that, compared with findings in vehicle-treated mice, synovial IL-1β expression and articular cartilage destruction were significantly reduced in animals treated with active A box protein compound. A box protein therapy also confers significant clinical protection in other experimental inflammatory conditions, including Gram-negative sepsis, endotoxemia, and pneumonia . RAGE is a cell-bound receptor of the immunoglobulin superfamily which is activated by a variety of proinflammatory ligands, including HMGB1, advanced glycated endproducts, members of S100 proteins, and amyloid beta-peptide . RAGE has a secretory splice isoform, sRAGE, which lacks the transmembrane domain and circulates in plasma. By competing with cell surface RAGE for ligand binding, sRAGE may act as a decoy receptor by removing circulating RAGE ligands. Consistent with the role of RAGE as an HMGB1 receptor, treatment with sRAGE protein can ameliorate both inflammation and structural damage in CIA . Anti-RAGE-specific mAb can also block an experimental model of sepsis , supporting this pathway as a target for therapies. Thrombomodulin is an endothelial anticoagulant cofactor that promotes thrombin-mediated formation of activated protein C. The N-terminal lectin-like domain of thrombomodulin is not functionally involved in the coagulation system but binds to HMGB1 and neutralizes its extracellular proinflammatory activity . Therapy based on truncated thrombomodulin can significantly ameliorate several forms of experimental arthritis . In addition to inhibiting the action of extracellular HMGB1, therapeutic strategies to promote intranuclear retention of HMGB1 have been explored. Among chemical approaches, covalent DNA adducts generated by the platinating antitumor drug oxaliplatin can sequester nuclear HMGB1, since HMGB1 avidly binds to sites of distorted DNA. Of interest, oxaliplatin treatment can reduce structural damage and inflammation in murine CIA as long as extracellular HMGB1 expression is low due to therapy . When oxaliplatin treatment is interrupted in this model, rebound of disease occurs, with clinical flare coinciding with massive extracellular HMGB1 release. Other heavy metals may also affect HMGB1 release. Thus, in vitro experiments have shown that gold salts can inhibit the nuclear export of HMGB1 in activated macrophages . The effect of gold appears to be specific for certain mediators since the release of HMGB1, NO, and IFN-β was inhibited by gold sodium thiomalate at pharmacologically relevant doses, whereas TNF release was not affected. These results suggest a new mechanism for the antirheumatic effects of gold salts in RA and the potential of drugs that interfere with intracellular HMGB1 transport mechanisms as novel agents to treat RA. In experimental disease models, the cholinergic anti-inflammatory pathway, a vagus nerve-dependent mechanism, inhibits HMGB1 release . A study of patients with RA showed an association of decreased vagus nerve activity with increased HMGB1 serum levels . The study did not allow a determination of causality but supports future attempts to stimulate the vagus nerve to decrease HMGB1 levels and ameliorate inflammation. Of note, acetylcholine in vagus nerve synapses mediates important anti-inflammatory effects via α7 nicotinic acetylcholine receptors (α7nAcR) present on the surface of macrophages and other cells. Selective agonists to α7nAcR are under development to treat inflammatory conditions . In addition to new agents, existing therapy may affect HMGB1 expression. Thus, intra-articular corticosteroid injections in RA patients can downregulate extranuclear expression of HMGB1 as well as synovial TNF-α and IL-1β. In contrast, synovial HMGB1 expression was not consistently influenced by TNF blocking therapy with infliximab in nine studied RA patients . These findings could suggest that HMGB1 acts upstream of TNF in the rheumatoid synovial inflammation. As an alarmin, HMGB1 can play a pivotal role in the pathogenesis of a wide variety of inflammatory conditions and may present a new target of therapy for RA and related rheumatic diseases. Future studies will define the pathways for HMGB1 release in disease, elucidate the most effective strategies for blocking the effect of this mediator, and determine the nature of any side effects that develop when levels of HMGB1 are reduced. Whatever the outcomes of these experiments, the study of HMGB1 should provide an important new perspective on the dynamics of these molecules inside the cell and the diversity of activities that these molecules display once they are outside. Financial support was provided through the regional agreement on medical training and clinical research (ALF) between the Stockholm County Council and the Karolinska Institutet; grants K2005-74X-09082, K2005-73X-14642, and K2006-1921-41244-35 of The Swedish Research Council; the Swedish Rheumatism Association; The Lupus Research Institute; and a VA Merit Review grant.